After a refreshing early morning run in Mumbai I recounted the route to my parents. I had run from Electric House, via Mantralaya, along the Chowpatty sea face, past Wilson College, to the top of the hill. “That&apos;s Walkeshwar hill,” my father revealed, “and if you had gone a little further you would have reached Baanganga and the Walkeshwar devasthan (temple or mandir).” My father explained how the Baanganga – the fresh water spring only a few yards from the ocean – came to be by the grace of Shri Rama. Being a Mumbaikar, I prided myself on knowing every significant site here. How did I miss this important landmark, while growing up only a few miles away? Perhaps I was not ready to walk here; here where Shri Rama walked? Next day, I continued running to the top of Walkeshwar hill and over to Baanganga. Here enroute to Lanka, Sita, Rama and Lakshman are believed to have rested. I too removed my shoes and stretched my feet. According to legend, Shri Rama and Lakshman did not find drinking water on this spit of land surrounded by salty ocean. Lakshman then shot an arrow into the ground, springing forth a stream of fresh water. The water pooled forming the Baanganga, (see pic above) refering to the purifying waters of river Ganga brought here by an arrow Baan. For his prayers, Rama fashioned a linga from the sand, giving the area its name Walkeshwar (Wallu – sand + Ishwar – God). The crudely fashioned linga, with petrified finger marks is now enshrined in the tiny Walkeshwar mandir right across from the Baanganga. The mandir is to the left on this schematic. 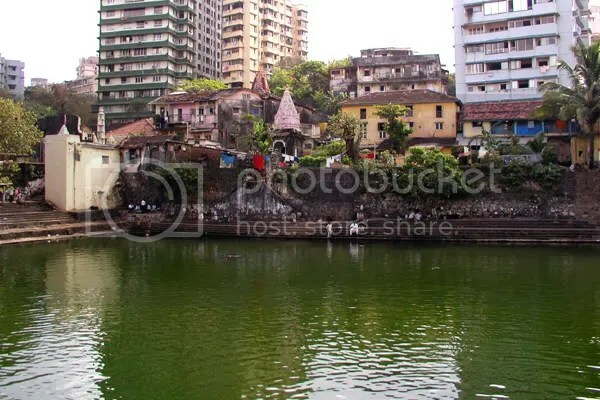 For bearings, the above pic was taken from the steps by the Ganapati mandir. 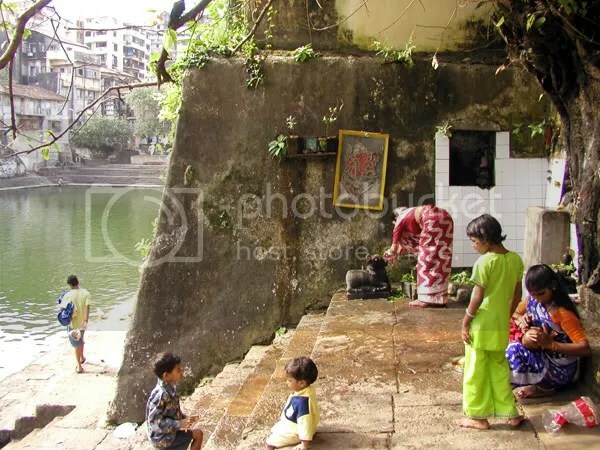 The Walkeshwar mandir is a tiny shrine and I shot this pic from the doorway. 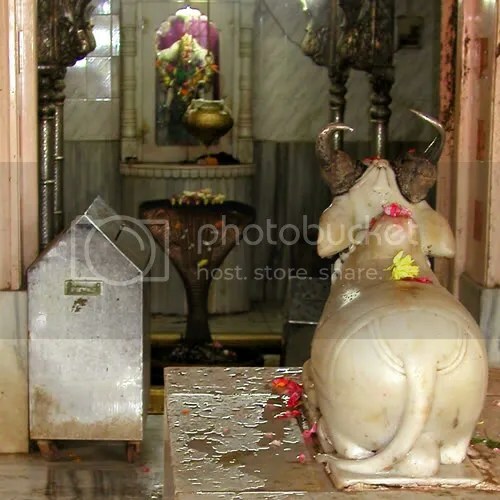 You can see the Nandi (seated bull) in the small antaralaya – foreroom. Past the collection box on the left, the linga is slightly below ground level, under the watchful eyes of the Naga Devata (Snake God). Early in the morning, all visitors can pour water on the linga (performing abhishek) and pray. My fingers traced the ridges on this linga, where Shri Rama’s fingers had crudely moulded and turned to stone. How many had touched this before me? The blessed Sita, Shri Rama and Lakshmana too! And the millions and millions of devotees before me, thanking the divine for her munificence. And then I realized, how insignificant my life is. A tiny being, a tiny droplet from the ocean of Brahman – the Paramatman. I let the water flow over my fingers over the linga, and watched it swirl away into the unknown. Another devotee had offered a few bael leaves on the linga. I picked one up as a blessing from the divine, touched it to my forehead and carefully placed it in my running shorts. I picked up my running shoes and walked around the numerous shrines, which have sprouted around this hallowed tank. In front of the Walkeshwar Mandir, these steps lead to the tank itself. There is a tiny shrine to Ganesha in the niche in the wall, behind where the lady in the red saree is praying to Nandi. The rest of the family appeared to be enjoying their outing here. 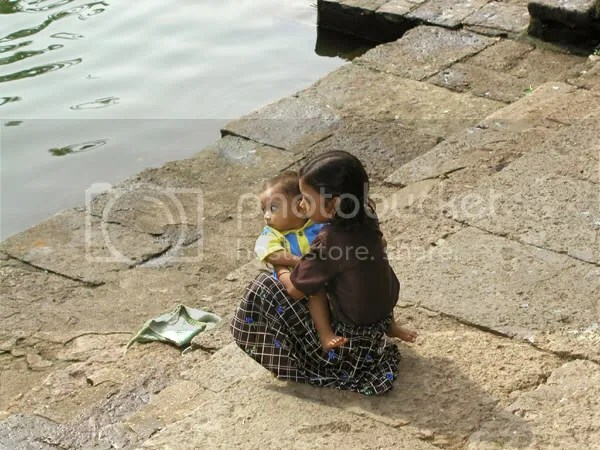 The little girl and the younger brother she held, were both mesmerized by the glinting waters of the Baanganga. Yes, its the shoes! It’s my running shoes which bring me to fascinating places, where I meet fabulous people and take away great memories. Everyday I run is a day to remember! If you see me smiling, its because I am running today!